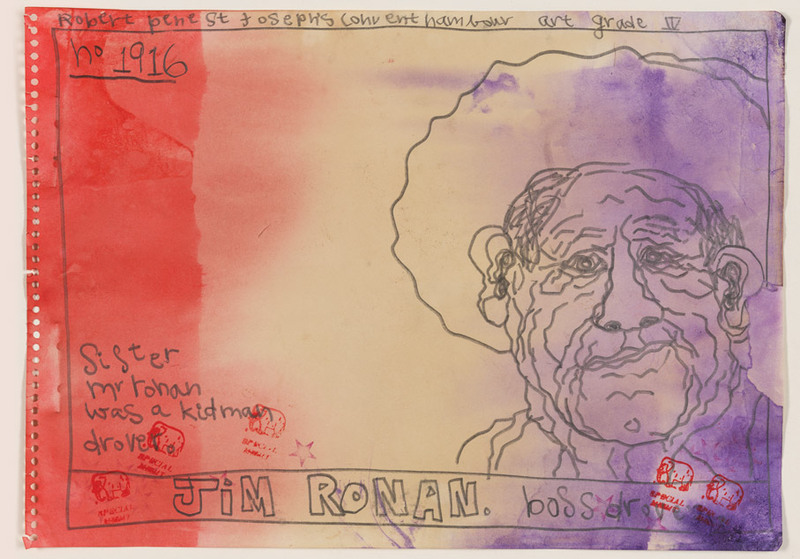 View a selection from Boss Drovers 1996 –2014 which comprise 2400 individual drawings, all deliberately executed as if by the hand of a ten-year-old. Over a 20-year period, Robert MacPherson made these in the guise of his alter ego, Robert Pene, a grade 4 student at St Joseph’s Convent, Nambour, Queensland. The project is dated 14 February 1947, and each sheet is stained to give it an aged patina. Pene has an obsession. He endlessly catalogues boss drovers in portraits that vividly evoke the resilient, determined spirit of the rugged individuals responsible for moving thousands of livestock and teams of stockmen and cooks along the great pastoral stock routes of Australia, travelling over vast distances from station to market, or finding feed and water in times of drought. ‘Robert MacPherson: Boss Drovers’ is a touring exhibition developed by the Queensland Art Gallery | Gallery of Modern Art. Image: Robert MacPherson, Australia b.1937, 1000 FROG POEMS: 1000 BOSS DROVERS (“YELLOW LEAF FALLING”) FOR H.S. (detail, no. 1916) 1996–2014. Graphite, ink and stain on paper. Purchased 2014 with funds from the Queensland Art Gallery | Gallery of Modern Art Foundation, Paul and Susan Taylor, and Donald and Christine McDonald / Collection: Queensland Art Gallery | Gallery of Modern Art.